Antique Sound Labs has earned a good reputation for producing valve equipment at very competitive prices. Initially, there were some reservations regarding build quality, a factor which becomes important above the entry-level. But today, thanks to the feedback from distributors all over the world, this flaw has been corrected. In fact in terms of components and finish, there are characteristics normally found on top-class apparatus. Certainly, those audiophiles who remain faithful to the more illustrious "marques" will still object. But given its performance, perhaps some of these "extremist" objections might be dropped. 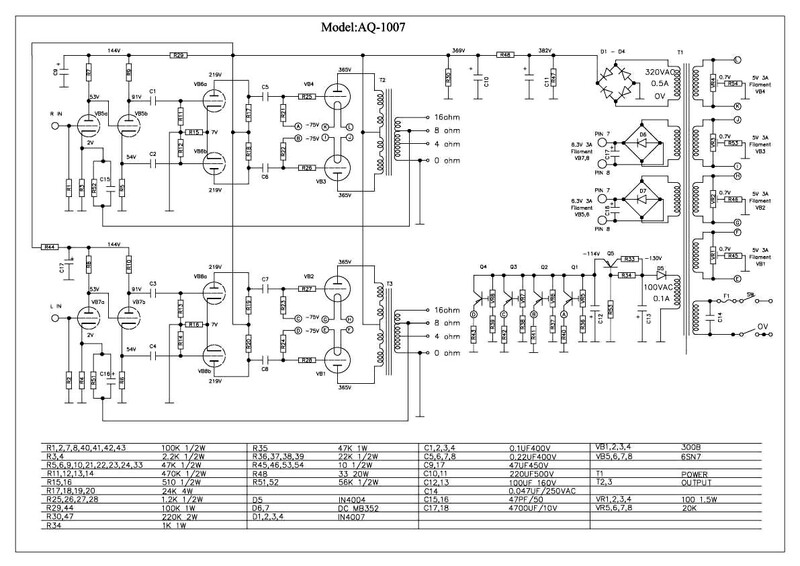 The AQ-1007 is an "A" class power amp offering 22 watts through a push-pull of 300Bs controlled by 4 6SN7s. 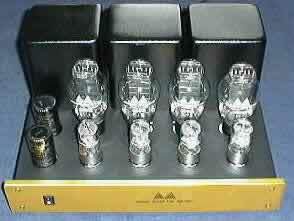 All 8 valves, plus 2 excellent Elna Cerafine capacitors (500v-220mF) emerge from a chromed metal panel. The front panel is in gold-plated aluminium, with the company logo in the centre. On the left side there is the on-off switch and an indicator light. Behind the valves there are the resin-coated transformers in black metal boxes. A classic layout. As far as I know there is no protective grill, which is required by safety regulations. The first pleasant surprise of this amp is that the entire right side is occupied by the selector and by 4 4mm connectors for bias regulation. This is extremely useful, since for the best performance this factor, which can vary with time, must be monitored. The suggested value is 55mA, although up to 60mA there are no audible defects. Beyond this figure, however, one starts to loose the magic sound, that acoustic blending, that only triodes can produce. For this fine-tuning operation a good tester is required. The importer has just told me that in future just such a tester will be sold along with the amp. An excellent commercial move and an added advantage for the purchaser. On the rear panel there is a standard IEC socket (very useful for recommended experiments with mains leads), a classic fuse box, two gold-plated input connectors, and 8 binding posts that allow 4,8 and 16 ohm connections. Excellent facilities to obtain the best possible interface. The construction is sober but precise, nothing more or less than what's needed. The 300Bs are ValveArt from O&J, while the 6SN7s are the well known (and appreciated) GT series Sovteks. We already mentioned the Cerafine condensers. The amp also looks reassuring inside. Tidy wiring with OFC cables. Mit Multicap condensers, nothing better for a quality product, low tolerance, metal-layer resistances. No signs whatsoever of cost-cutting. If I were buying this amp, I'd be very happy not to be paying an extra 500 Euros for exotic wood side panels. With these Antique Sound Labs, you have the feeling of paying the right price for what really influences the sound they produce. The AQ-1007 used to cost 3,300 Euros, but the price-list that is about to be published, thanks to new commercial policies, sets the price at around 2,700 Euros. Bear in mind that if there is no trade-in, a discount of 10-15% may be expected. This would make it the machine to beat in its price/quality category. Slightly worried by the 87db efficiency of my speakers, I connect everything up and proceed with some warm-up playing. It takes about 30 minutes to warm up, an hour to sound its best (on a hot summer day). The test amplifier did not require any running-in, having presumable played previously. A new one would, instead, require a progressive burn-in period. There is, to begin with, a good feeling of power. Even with not very efficient speakers. With 87db speakers in a 6 X 4 metre room the sound is perfectly sufficient, perhaps not absolutely realistic in volume but loud enough to have the neighbours starting to think about complaining. 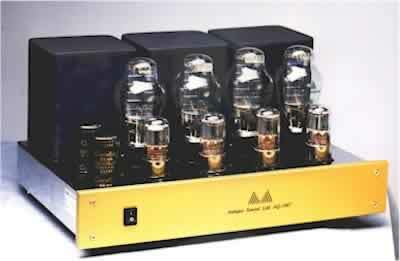 The "flavour" of the sound is exactly what you'd expect from a triode amp. The velvet touch is certainly there, even when connected to a solid state pre-amp of mediocre quality. I then wired it up to an ARC SP9 mkIII and a pair of ProArc Response 2.5. This produced a substantial improvement and allowed me to use the turntable, and to continue the test in better circumstances. The characteristic that emerged above all others was the complete absence of "listening fatigue." Maybe the test should end here, since this is the aspect that most determines if a stereo sounds "good" or "bad," without getting too twisted up in contrast, dynamic extension and grain. The AQ-1007 has good general dynamics, a corrected and homogenous extension, with a slight roll-off of the treble. The bass lacks a little agility in very difficult passages, but is correctly reproduced with great extension and without trailing all over the room. But it may be a good idea not to use speakers that are too exuberant in the lower register. Little to say on the mid-range. This is where we find the intrinsic superiority of directly-heated triodes. I've never heard a triode with a bad mid-range. In this case, indeed, the mid-range is also lucid, fluid and warm, without any roughness. Both male and female voices sound very natural. In fact it is with male voices, which in my opinion are harder to reproduce, the AQ-1007 gives of its best, particularly with the darker nuances. The musical stage is rigorous and without excess. The instruments are correctly spaced out and clearly in focus. No drum kits four meters wide or eight foot singers. Everything is in its proper place, which is a quality not to be sneezed at! Great depth in the centre and closing sides in a semi-circle around the listener. A slight drop in performance can be noticed when playing at very high volume. First, something is lost in the harmonics of acoustic instruments and then in the sharpness of focus around the performers. In the "all-vinyl" test of this amp I used the splendid "Jazz" by Ry Cooder, a recording all based on acoustic instruments, and a great Decca FFRR of exceptional recording quality, Eugenio Lima - "Fado Portoghese," just guitar, bass and accordion. The roundness of the acoustic instruments was reproduced without uncertainty or shadowy areas, with exemplary correctness. Then the inevitable "Time Out" by Dave Brubeck, which I always use to test transients and space reproduction, Ricky Lee Jones' album of the same title for the nuances of a female voice which is both harsh and sweet, and the explosive bluegrass of Seldom Scene's "Act 3." Lastly, I used "Crueza de Ma" by De Andr�, with its environmental sounds and atmospheres, instruments of all kinds and the laudably reproduced voice of De Andr� himself. I also tried a CD, "Score" by The Fugees, well recorded rap with good voices deep bass and studio sounds. Possibly using it with a valve pre-amp. Choosing one of the same brand would be a safeguard against possible incompatibility. I'm not saying it does not work well with a solid state pre, on the contrary. But a good match would have to come after careful listening tests. Bear in mind the need for adequate cooling. The AQ-1007 produces a good amount of heat and needs at least 40cm of space above. Use a special mains cable, and when you've found the right one by-pass the IEC socket and solder it directly to the terminals inside. Place it on cones on a solid base. The standard feet are a bit weedy, and I obtained some improvement with the Michell Tenderfeet. Many of those who buy it will find it hard to resist, particularly since the wiring diagram comes with the amp. The use of top quality valves and paper/oil condensers along the signal path could bring substantial improvements. Do not ignore the mains cable using the TNT-TTS cable I already noticed a difference. When you find the right one, solder it directly inside. A good mains conditioner could also do wonders. A test passed with flying colours, a machine that makes you re-discover the pleasure of listening to music rather than the system. To improve on it, one would have to move up into a really high price bracket. For equivalent value for money, as far as I know the only alternatives in this kind of amp are DIY construction or the second hand market.